Cycling is gaining momentum in Russia, quite literally, and hardly a single weekend this summer will go by without a bike run. The bike races will be for charity, theme-based, and even costumed. This summer will be super busy with cycling activities. The first event, “Bike to Work”, has already been held. Thousands of people were encouraged to travel to work by bike. Don’t forget that Russian cities are large, and sometimes it takes a few hours and plenty of courage (or folly) to navigate the roads. … and fun for all! Girls from Astrakhan enjoy it for sure. St Petersburg women cycle too. The city counts numerous small canals and backstreets, making cycling a truly inspiring and remarkable experience. Astrakhan cyclists are happy to be a part of this mass celebratory bike parade. Who said you can’t ride a bike and look great at the same time? Tweet Run is Europe’s main costumed bike parade, which has been held in St Petersburg and Moscow for several years now. The city's streets and building facades look very European and provide a great backdrop for this retro-style event. The only downside is that the warm weather be gone in four months. 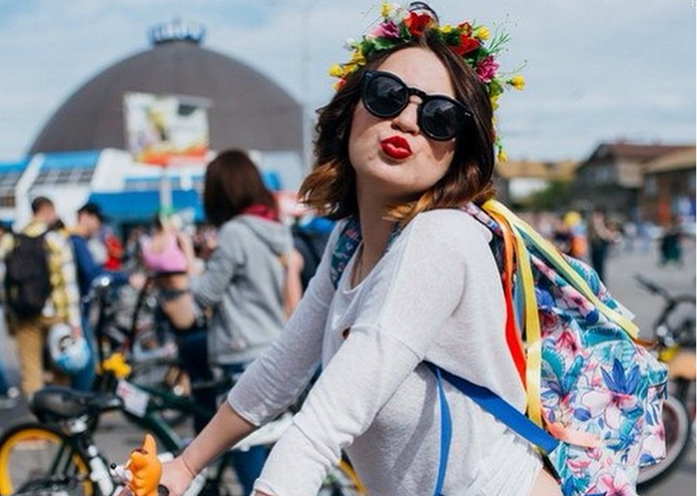 Russians know what that means — not a single day without a bike.